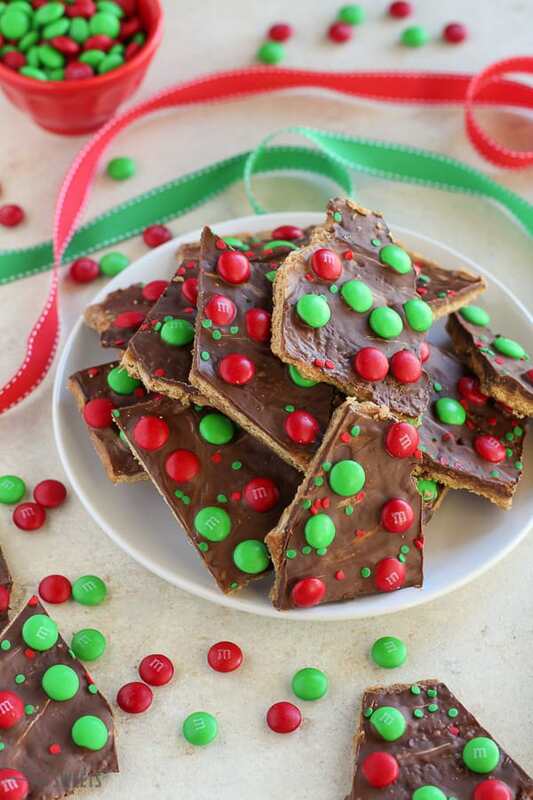 This festive Christmas Bark is easy and delicious! Layers of graham crackers, brown sugar toffee, peanut butter, and chocolate make this an addictive holiday treat. Can you believe we’re into the last month of the year? What has your December looked like? Are you existing on a diet of Egg Nog Lattes and Christmas cookies? If not, it’s time to start. Bake some cookies, drop extra marshmallows into your hot chocolate, and let’s do this season right. This is the time of year that I make batch after batch of my favorite Pecan Praline Bark. But today I’m switching things up with this super easy Christmas Bark. Making edible gifts for friends and family is one of my favorite parts of the season. If you’re looking for some other Christmas treats, try my: Peppermint Cookies, Sugar Cookies or Cookie Mix in a Jar. You might know also know this as Christmas crack, or graham cracker toffee. 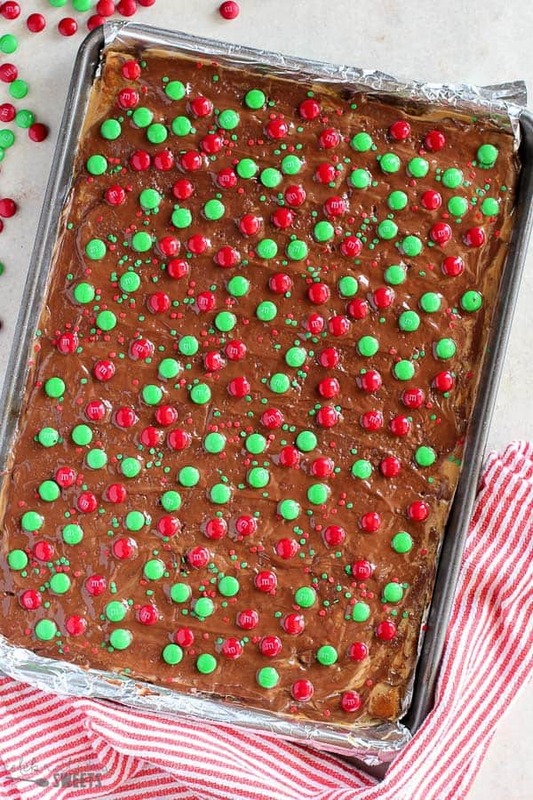 It’s a layer of graham crackers topped with brown sugar toffee, melted chocolate, and any festive holiday toppings you choose (I used M&M’s and sprinkles). And because I absolutely love the combo of chocolate and peanut butter, I also added some peanut butter into this Christmas Bark. Bonus: There is no actual “toffee” in this recipe. We are making a toffee-like mixture of butter and brown sugar and pouring it over graham crackers which serve as our crunchy base. This is way easier than making real toffee, no candy thermometer needed. Woohoo! This recipe makes a big batch of toffee that you can share with anyone and everyone. Package it up for gifts, stash some in your freezer for late night snacking, or set it out and watch it disappear. Everyone goes crazy for this stuff, you will be glad you made a big batch! Also to be noted: If you’re anything like me, you will be stealing bites as you’re breaking it up. Worry not, no one will even know any is missing. Graham crackers – Layer them in the bottom of a rimmed baking sheet. 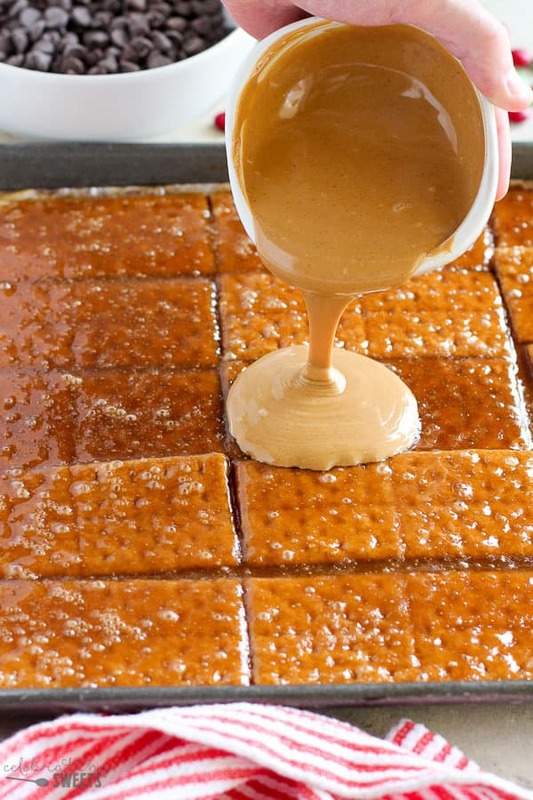 Toffee – A quick mixture of butter and brown sugar gets poured over the graham crackers. Peanut butter – Optional, but SO delicious. Pour it over the toffee. Chocolate – Sprinkle over chocolate chips and allow them to melt, then spread with a spatula. 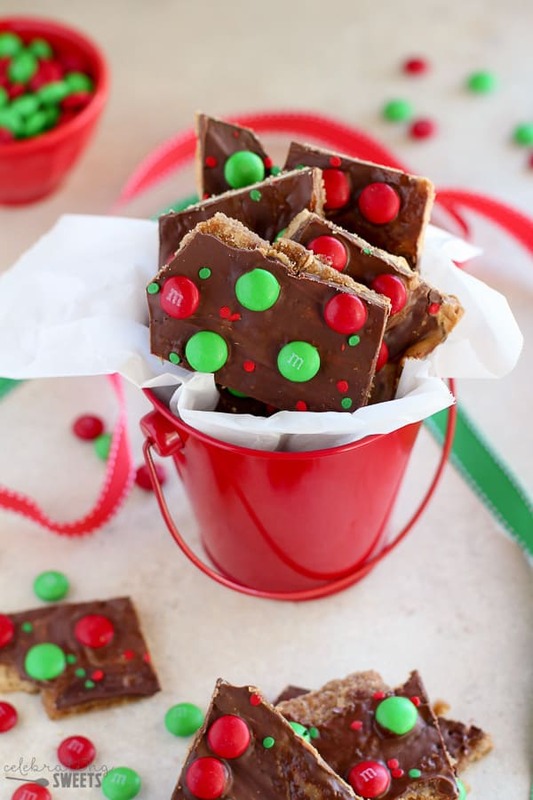 Holiday candies and sprinkles – I add holiday M&M’s and red and green sprinkles. Preheat oven to 400°F. Line a 13x18 rimmed baking sheet with foil and spray it with nonstick spray. Lay the graham cracker sheets in a single layer, side by side in the pan, breaking pieces as needed to fill the pan. Place butter and brown sugar in a medium saucepan. Bring the mixture to a boil, and boil for 3 minutes, stirring occasionally. Carefully pour over the graham crackers. Use a rubber spatula to evenly spread the mixture over the graham crackers. Place the pan in the oven for 4 minutes. Remove from the oven and pour the melted peanut butter on top. Use a rubber spatula to evenly spread the peanut butter. Sprinkle with chocolate chips and place back in the oven for 1 additional minute, to melt the chocolate. Remove from the oven and use an offset spatula to evenly spread the melted chocolate. Allow to cool just slightly, then sprinkle the top with M&M’S and sprinkles. Cool to room temperature, then transfer to the refrigerator to firm up completely. Once chilled, break the toffee into irregular pieces. Store in the refrigerator. Hi, Natalie. I would not recommend that. The base of the toffee needs to be hard and sturdy. You could try using speculoos or Biscoff cookies, I believe you have those there? They are rectangular, which should make for easier placement in the pan. Thanks for stopping by. Enjoy! I’ve always made this bark with saltine crackers. The graham crackers sound delicious though, and I have the crackers stocked. Looking forward to trying this variation! I have never tried bark with graham crackers! This is a great idea and I have to try this ASAP! Yummy! I’m so into Christmas Bark. 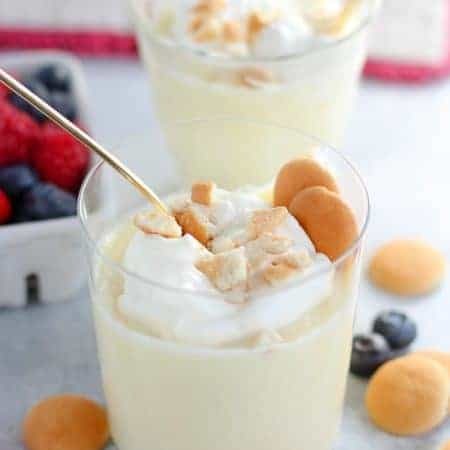 Love the graham cracker lat=yer on the bottom of yours. This looks and sounds delicious! 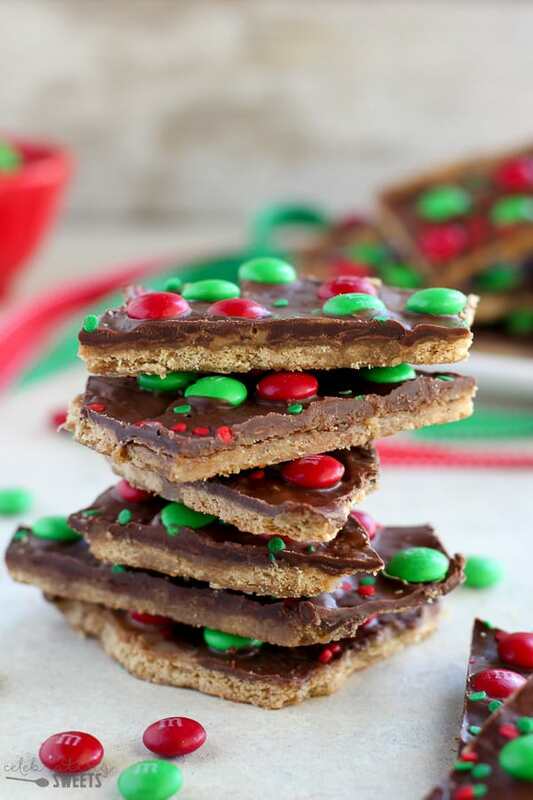 Just by looking at the pictures, I know that I would devour this Christmas Bark in a hurry! You really can’t go wrong with these combinations of ingredients… So good! This is SO GOOD!!!! Super easy to make. I’m not a baker by any means, but this was fool proof. I cut up the m&m’s before topping. I had to stop myself from licking all the spatulas and eating all the small bits after breaking the sheet up. Very very delicious and will definitely be making again. Yay! I’m totally with you on eating the small bits – that’s the perk of being the cook. Ha! Thanks for stopping by. Happy holidays! 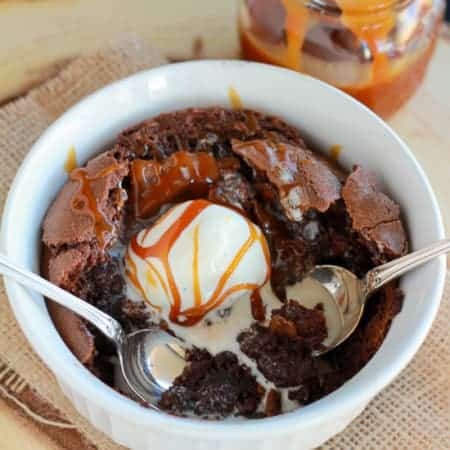 I’m doing a whole bunch of baking today, adding this to my list…. Looks great and so quick and simple. With two small boys running around the kitchen while trying to bake, simple yet delicious recipes are always welcome! Thank you! Perfect! I hope you enjoy it! Happy holidays! I would like to make ahead of time..can this be stored in the freezer?? Hi, Lisa. I have never frozen this specific recipe, but I have done so with something similar, so I would guess that you could. Enjoy! I made up 3 batches last night. It’s absolutely delicious!!! One problem I’ve encountered though, when I attempt to break them into small pieces(I’ve only broken one so far) the top layer of chocolate completely falls off some of the pieces. Any suggestions as to how I’d be able to stop this from happening? Hi, Jesse. My recommendation is not to break the pieces too small. I usually break mine into 3-4 bite pieces. I have never had trouble with chocolate falling off, I’m wondering if the oil in your peanut butter separated and is keeping the chocolate from sticking? If you ever make this again, try using a different brand of peanut butter. That would be my best guess. Enjoy! Happy holidays! 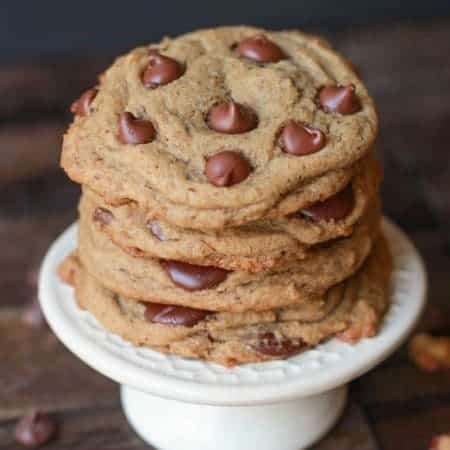 Hi, I tried making this but it didn’t work out… the chocolate chips never melted? I tried even leaving them in the oven for 10mins and they still didn’t melt..? The chocolate chips were starting to burn, even tried covering with aluminum foil and lowering the heat. It was on a metal baking sheet so I couldn’t even try putting it in the microwave. It tastes good but definitely does not look like Christmas bark. I wonder if melting the chocolate first in a pot then pouring over would have been a better idea? Hi, Alex. There was definitely something wrong with your chocolate chips. 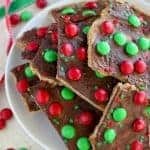 This recipe is similar to dozens of other “christmas crack” recipes which use the same method of placing the chocolate chips on top of the hot toffee and crackers. The heat of an oven should melt chocolate chips in a matter of minutes. Perhaps your chocolate chips were old? Or they were not made from real chocolate? I’m sorry it didn’t work out for you.